Lin Zhang and her husband Cheng-Hung Tsai met each other in Darwin, and bought their first house there. The house was on Charlotte Street, so they named their daughter Charlotte. They loved the old-fashioned feel of the name, and liked the idea of a link between the first house and the first baby. Charlotte was the most popular girl’s name in the Northern Territory the year Charlotte Tsai was born, and it’s a nice reminder that even the #1 name can have a good story behind it. 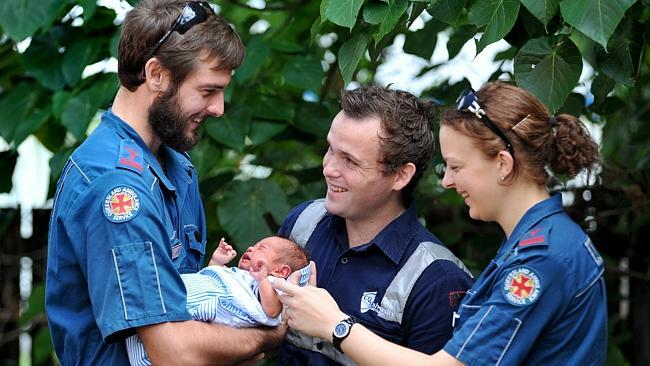 A baby boy born in Cairns was delivered at home with the help of paramedics named Jeremy Lawrance and Alex May [pictured]. His parents Kurt Caulton and Georgina Saltmere had a very easy decision to make choosing a baby name – his name is Jeremy Alexander after the paramedics who were there to bring him into the world. Sydney barrister Julie Taylor was 19 weeks pregnant when she was taken hostage in the siege at the Lindt Cafe last December. Although she managed to escape minutes before police stormed into the building, her best friend Katrina Dawson lost her life during the exchange of gunfire. Julie’s daughter was born last month, and she is named Emily Katrina in honour of Ms Dawson. Journalist Josephine Cafagna had a rotten time in 2014, losing five loved ones. But there was a beautiful ending to the year, when she welcomed a grandnephew named Alessio Luke, the first person of the new generation born in their family. Josephine’s mum, now a great-grandmother, showed Alessio’s parents a piece of paper where she’d written down her three favourite names for the expected baby. Being a good grandmother and not wanting to impose, she kept her thoughts to herself, but one of the names was Elisio, which she found in the Bible (it’s the Italian form of Elisha). The middle name Luke is after an uncle who died as a teenager in a terrible accident, and is still deeply missed. Earlier this year I wrote about New South Wales tightening up their birth registry legislation after a couple of tragic events involving newborn babies. One of them was a baby girl whose remains were found buried on Maroubra Beach in Sydney’s eastern suburbs, and her parents never located. Maroubra local Bill Green, and his wife Filomena d’Alessandro, read that the baby girl would receive a destitute burial, and were determined that not happen. They officially “adopted” the baby, and arranged a memorial service in her honour, giving her the name Lily Grace. Every year there will be a ceremony for Lily, and children like her, who have died without a known family. This year is the centenary of Anzac, and it will also be the 100th birthday of Anzac Dowker in November. Her mother Elizabeth had six children, with Anzac being the second-last born, and she was having trouble thinking of names for the baby. The man at the registry office suggested Anzac as a name they might like, so she was named Bessie Anzac. However, she didn’t like her first name, and has always gone by her middle name, Anzac. Anzac is very proud of her patriotic name. Yolanda Lionheart “Yoli“: Parents Lena and Carlo picked Yolanda because it is a Spanish name; they met in Spain, and Yolanda was conceived there. The middle name came about because when Yolanda was a newborn, she made squeaky little roaring noises like a lion cub. It’s a name that melts Lena’s heart every time she says it, but unfortunately the name didn’t get approval from the grandparents. Yolanda has a big sister named Francesca. Ace: Ace’s dad is named Radley, nicknamed “Rad”, and mum Jess felt sure that someone named Rad needed a son named Ace! Luckily Rad agreed. Narayan: Narayan’s dad James belongs to the Hare Krishna movement, and he is named in honour of his father’s personal guru. Narayan is a Sanskrit name for Vishnu (God), meaning “the essence of all”. Narayan’s mum is named Krystal. Sisters Taleah and Emmi-Belle: Mum Nikki had picked out the names Sofia and Daisy for her daughters, but dad Chris insisted that they were Taleah and Emmi-Belle. Dad won both times, and luckily Nikki agrees he made the right decisions. Henley Violet: Mum Emma had her heart set on a flower name, because floristry and gardening is something she loved sharing with her mother. The names Dahlia, Rose and Ivy were all considered, but didn’t seem right. So it was decided the middle name would be a flower instead. Dad Tim had fallen in love with the name Henley after watching a movie (maybe Now You See Me, with Isla Fisher in the role of Henley Reeves), and started calling his daughter Henley before she was even born. Emma was worried about the possibility of “Hen” as the nickname, but she now often calls her daughter “little Hen”. Shayla Tigerlily: Mum Tegan was going to be called Shayden if she was a boy, and had always wanted to call her son Shayden. She had a girl instead, but considers Shayla a feminine form of Shayden. Tigerlily was chosen as a middle name because Tegan loves nature and flowers. Theodore Luca: Dad Oliver liked the name Ted and mum Charlotte loved the name Theodore, so the name worked for both of them. They like that it means “God’s gift”, and they believe that Luca means “light”.